Parents will provide their child’s equipment of a more ‘personal’ nature. This includes their helmet (white), practice pants, practice jersey, cleats, socks, protective athletic cup and mouthpiece (must be a colored mouthpiece, not clear). 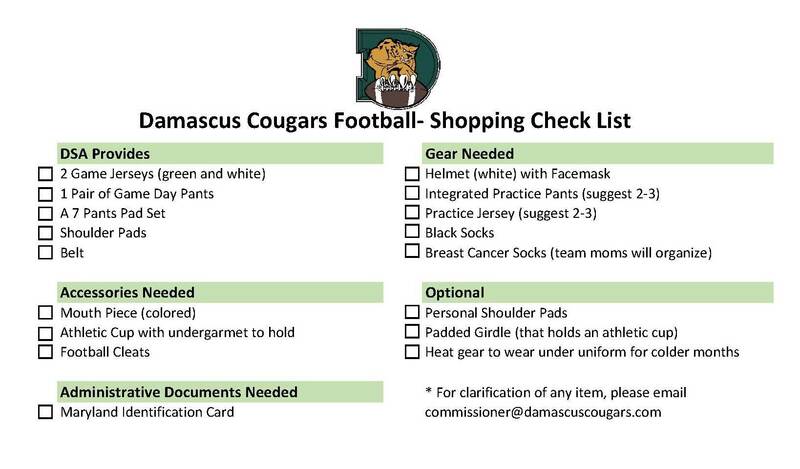 Click here to view the suggested shopping check list. Your coach will let your team know your practice days for the rest of the summer and once school starts. Weigh-ins will be conducted on TBD. A make-up day is scheduled for TBD. Please be sure to visit the CCFL website to view the weight chart. The MVA no longer has the ability to print ID cards or learner’s permits locally. These products are now being issued through a central print farm and are mailed from the MVA headquarters in Glen Burnie. It will take approximately 2 weeks to receive ID cards once you have gone to the MVA to apply. Damascus Sports Association (DSA) is a volunteer organization dedicated to providing an enjoyable, rewarding sport experience to children and their parents. We receive NO public funding and our success is the result of the work done by our volunteers. All parents/guardians are required to volunteer the number of hours requested to assist with their child’s current sport’s program. The “team mom” will distribute the volunteer schedule at the beginning of the season. If a volunteer is unable to fulfill a position, a replacement must be found. If an assigned position is left open and unaccounted for, that volunteer’s membership will be assessed a fee of $100 (must be paid within 5 business days). Additionally, that family’s membership will be placed on hold after the 5 business days and no one registered through this membership will be permitted to participate in any sport until such fee is paid in full. CCFL releases game schedules in the summer. Regular season games typically begin the weekend prior to the Labor Day holiday and almost always take place on Saturdays. The regular season is typically 9 games long. Our home field is located at Damascus High School.